Quiet boutique BnB; close to everything. Coffs Jetty BnB is located at the Jetty within a 5 minute walk to restaurants, shopping and beaches. It is very suitable for COMPANY REPS who are looking for a" home away from home" experience or the DISCERNING TRAVELLER who enjoys a very comfortable bed in the most modern of rooms available in Coffs Harbour. The BnB was established in October 2011 in a purpose built property with the latest modern facilities. It is situated in a beautifully quiet location yet so close to everything. We offer a choice of 2 bed and breakfast Suites and a Studio. The 2 BnB Suites located on the 1st floor have a quality Queen bed with Luxury ensuites and include walk in robe,ceiling fan, reverse cycle air, LCD TV, microwave, coffee & tea making facilities, hair dryer, access to bar fridge and large balcony. A continental breakfast is included in the tariff for each person, however we do offer our hot "Jetty BNB" breakfast for an additional $15 per person. Please ask for more details when making your booking. The GARDEN SUITE, which is a SELF CONTAINED STUDIO APARTMENT , is located on the ground floor & has a queen bed with luxury ensuite that has a bath with shower over, ceiling fan, reverse cycle air conditioning, heating, LCD TV, small kitchenette with bar fridge, microwave, all kitchen utensils, coffee and tea making facilities & hair dryer. This suite opens onto a private garden patio area. ALL SUITES ARE DESIGNED FOR UP TO 2 (TWO) PEOPLE ONLY AND ARE NOT SUITABLE FOR OR ACCOMMODATE YOUNG CHILDREN AND BABIES. A continental breakfast is included in the tariff for each person, however we do offer our hot "Jetty BNB" breakfast for just $15 per person extra. Please ask for more details at the time of making a booking. Breakfast is generally served on the patio (weather permitting) or in our large spacious dining area. Coffs Jetty BnB is the perfect place for a one night relax or take a week and enjoy all that the Coffs Coast has to offer. We are 500 metres from the Pacific Ocean and Jetty Beach which is great for swimming. View to rolling hills to the north. This was a perfect Bed & Breakfast spot to stay while heading north. Stayed in apartment which has lots of living space in lounge & bedroom. Lots of bedroom drawers & closet space. Full kitchen facilities. Thoroughly enjoyed our stay at Coffs Jetty, very spacious room and well equipped, very comfortable bed. Would recommend a stay here. Excellent location for stopover in Coffs Harbour. Hosts were extremely obliging and went out of their way to make us feel welcome. Accommodation was extremely clean and bed very comfortable. Location excellent in terms of restaurants and beach. Very clean and tidy accomodation. Hosts were excellent and very helpful and friendly. We were recommended this place by friends - and it didn't disappoint. 2. The room we had was excellent, clean, good faciities etc. Coffs Jetty Bed and Breakfast is centrally located at Coffs Harbour Jetty; close to everything. 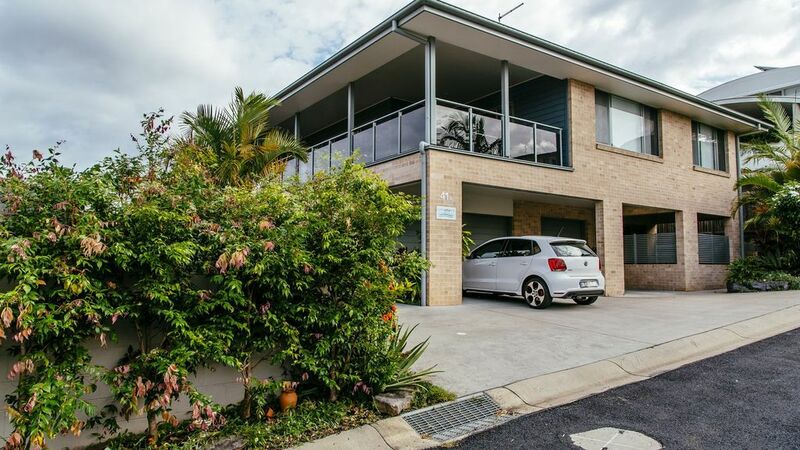 It is just 2 minutes walk to a range of great restaurants , 5 minutes to Jetty Beach, Mutton Bird Island, Dolphin Marine Magic, scenic walks, Coffs Harbour Jetty and Marina.